This article was cross posted to Power Retail. 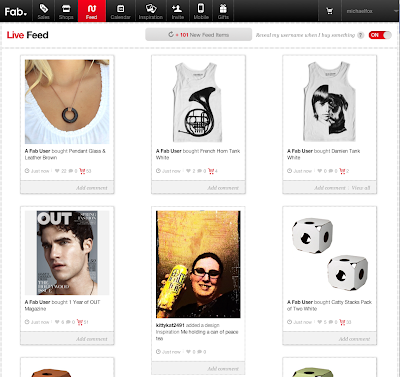 Fab.com is a New York based e-commerce site offering design inspired products in a flash sale site format. At only 6 months old they're on track to shortly reach $100m revenue. More than half their 1.4m members have joined the site via social media platforms. Last week Fab.com launched their 'Fab Live Feed' which is essentially a Facebook style news feed showing what other Fab.com members are buying, liking, tweeting and sharing, live. Fab.com CEO Jason Goldberg says, "We envision that Fab users will be able to easily and quickly discover what other people are buying, what’s popular, what’s being most discussed — all in realtime as it happens." The live feed highlights, in a magazine style format, new products I may not have otherwise found browsing the site by categories. In addition, when I see a products with hundreds of comments, likes and purchases, it tells me that other people have judged this product to be a good one and I'm more interested to purchase it. I've liked, +1'd and commented on a number of items I've seen in the feed and these interactions then spread to Facebook and Google Plus introducing my friends to Fab.com and they're products. Fab.com just closed a $40m round of funding at a ~$200m valuation and the biggest area they'll be investing that money into is social commerce. CEO Jason Goldberg says, "We’re going to take social shopping to the extreme. This is just the start." How are you approaching social commerce in your online retail business? I think what Fab is doing to revolutionise the social shopping is fantastic. But after checking back into the site having not been there for a few months, it's starting to feel very cluttered. I know adding new features is vital to keep existing users but I wonder if Jason is doing frequent cohort analyses and being strict about taking a hatchet to the features that aren't getting the desired traction or lowering new user retention rates. I also think some features will come into their own as they develop out of their social commerce features. I got the impression their inspiration wall was petering out after an initial spurt of use, but then they've integrated it into their live feed and it's not a new source of content for the feed, which may well take people back to the inspiration wall. They're doing very impressive things, certainly one to watch.